I'm sure that there are many people out there upon viewing the title would think that I'm starting a diet. And am therefor saying goodbye to a yummy baked good. Sadly I'm not. On Monday, December 22nd my best friend, Greta, had to say goodbye to a good friend of 15 years. It took me a bit to actually write this. And for that I apologize. And you may want a hankie for this, but only if you're the sentimental type. I know I am. That's right. Strudel was a red daschund. She was better known as Stru. Occasionally I called her competition since she loved my sweet baboo. And he adored her. And there were times I had to fight her for his attention. How could you not love her though? Just look at these pictures of her. As I said she was 15, which is longer than most daschunds live. The breed tends to have back problems. And what a life that little darling had. She loved just about everyone that she met. The first time she met my hubby she lost control of her bladder she was so excited. From then on we had to call before coming over so that she could be put outside to greet us. We sometimes joked that she was a life support system for a nose, because she liked to sniff so much. And as most mature women do as they age she put on a bit of weight. We jokingly referred to her as a yard cow. Not only because of her size, but because she liked to eat grass. A lot. She had eyes that melted you. But she was smart too. She could say 'Rugrat'. And she'd dance too. And if ever she saw someone unhappy, especially Greta, she would hurry to comfort them. She didn't like to see people cry. 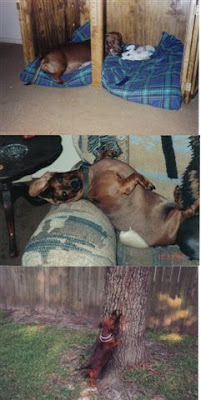 And as you can see from the middle picture she was a bit of a ham. When Greta and Steve brought Colten home there were concerns that she might not like having to share the attention. Instead she started mothering Colten and always wanted his toes clean. Farewell sweet girl. You will be missed. Thank you Michelle for the tribute. if anyone asks the difference between a friends I can tell you. A friend will ask if they can do anything. a good friend will stop by and check on you. but a best friend will go with you and let you cry on their shoulder. thanks for being there with us at the end Michelle. I will never forget it.